“I’ll be dead in a month,” she said, just as I was ready to leave. A door knob disclosure. I sat back down. Susan said her mother had predicted and orchestrated her passing. I asked what she was feeling now and Susie said, “Just a sense. And pain.” We spoke a bit longer before I had to leave, as I was already late for my grandson’s birthday cake celebration. It was the last time I saw her, about a month ago. Susan was my muse. She started the transfer of my thoughts to paper in a more consistent way. She assigned me tasks I thought were beyond me but proved me wrong. Our interactions ebbed and flowed over the years. She came on some of my hikes while recovering from her bouts of cancer. I worked for her husband for a few seasons. Then, after The Election, our contact reestablished through her Poet’s Corner at the library devoted to Resistance. Susan wanted to publish more of her poetry and I offered my skills and experience using self-publishing. Thus began seven months of regular meetings to review and edit her poems. Throughout all her treatments and challenges, Susan continued to revise her work. Even that final visit included the transfer of final edits of her short poems and ditties book. A year or so ago, a sign went up on Route 9 as it passed north through my town, Middletown, CT. A section of the road was dedicated to the memory of Major General Maurice Rose. I decided to find out more. Maurice Rose was born in Middletown in 1899; a plaque marks the location on Main Street. When he was four, his family moved to Denver. Rose was determined to join the military and served in both World War I and II. It was in 1944 in Germany, after multiple medals and heroic accomplishments, that Rose was shot by the Germans. His initial grave was later moved to the Netherlands. In his memory, the following are named after him: a school in the Netherlands, a hospital in Denver, a Jewish War Veterans Post 51 in Middletown, and the Middletown Armed Forces Reserve Center. The most remarkable occurrence at a recent presentation about Rose by Post 51’s Karen Uberti was the arrival of a WWII colleague. Almost ninety-eight year old Bob Swarsky arrived by wheelchair, maneuvered by his friend Glenn, to tell of his personal recollections of the day that Rose was killed. With hearing and mental agility that surpassed most of us in the room, Swarsky spoke about many efforts of the 3rd Armored Division, First Army. As those who served during that time get fewer and fewer, it becomes even more important and poignant to hear their stories and honor their memories. Loud live music ricocheting down the stairs and out into the street, the hubbub of many conversation, food and drink – in the LIBRARY (no ‘shhh’ here!!) It was the opening of Pierre Sylvain’s art show Fantastical Journey: voodoo, slavery jazz! at Middletown’s Russell Library. Pierre (who lives in Middletown with his wife, son, and daughter) is a Haitian native who paints about his home country, and the culture and music of African Americans in the United States. His styles and colors vary, but his passion and energy come through all his work. The paintings are on display in the main lobby and upstairs near the information desk through March 31 during regular Russell Library hours, 123 Broad Street, Middletown. The space in the Zilkha gallery on Wesleyan University’s campus is currently housing paintings by six New York City women (Gina Beavers, Katherine Berhnardt, Katherine Bradford, Jackie Gendel, Liz Markus, and Rose Wylie) in a show entitled A New Subjectivity: Figurative Painting After 2000, curated by Jason Stopa. Staff who unpacked the works said the shipping materials were as varied as the content. The exhibit runs through Sunday, March 4 during regular gallery hours: Tuesday, noon-7p, Wed-Sun noon-5p. Walk-through available February 13 at 4:30pm and guided tours on Saturdays at 1m. All events are free and open to the public. Sometimes we don’t know the impact we have on others. Teachers may touch a student and never learn about it. A kind word or considerate action may brighten someone’s day in a significant way. And sometimes it’s a restaurant that touches many people without even realizing it. Such is the case of the Cypress Restaurant in Middletown, Connecticut, now closing its doors after 80 years. First started by James and Rose Carta, the diner hosted celebrities such as Al Jolson, Glenn Miller, Eleanor Roosevelt, and Benny Goodman in its heyday. Later, the restaurant was taken over by twin sons Joe and Jimmy. People came for traditional All-American dinners that included some Italian specialties, and many home-style meals such as meatloaf and open-faced sandwiches with gravy. It was a place for weddings, baby showers, and all kinds of celebrations. People met their future spouses there. Great friendships developed. I myself did a book signing there to a standing room only crowd. I hosted my daughter’s master’s celebration there. She had her baby shower there. And we attended many family and public gatherings at that site. There were those who are regulars at the bar, a sort of Cheers-like family. They knew each other’s ups and downs. They anguished over people gone missing and mourned the passing of their members. The staff was legendary and the average length of stay was more than 14 years. Certain people, like Helen, waitressed there forever. In recent years, they encouraged local bands, trivia night, open mic, and all sorts of just regular good fun. It was a place that supported the Carta families for many years but Joe and Jimmy had reached the age where they deserve some time off. They found a family-oriented buyer for the Cypress. So, after 80 years, they were closing. Yesterday was their final day and it was standing room only. Cars were parked all over nearby lawns and overflowed into the school parking lot behind the restaurant. The place was so packed, it was impossible to walk from one end of the diner to the other. Waitresses were taking orders out the front door and back in the bar door in order to reach their customers. The place was jammed, the place was hopping. For a while, I sat with a daughter of each of the twins. They were commenting on this person and that who walked in. So many people. Some they didn’t even know. And I realized that The Cypress was one of those places that served not only good meals but good will, heartfelt connections, and strong caring. It was a place where people could feel at home and musicians felt they were playing in someone’s living room. People who had no one could go and feel comfortable. The Cypress, its owners, and staff touch the hearts of many. And we had all come to say goodbye. Cherry and I are back to exploring trails and hiking for Friendly’s. Today was in the thirties with a dusting of snow, but we were no deterred. We headed to northern Middletown to check out the multi-use trail along the Mattabesset River. After leaving one car at the Cromwell Friendly’s, we couldn’t locate the trail head at the cul-de-sac on Tuttle Place. We tried a few other side roads until we found a lovely entrance on Moss Glen. Meanwhile, we were catching up in the car on our lives since our last encounter. Heading down to the river, there was a slight sheen of snow on the paved bike path. We headed west when we reached the main route and enjoyed walking along the Mattabesset, under West Road, and along condos in the Westlake area. Cherry noted that she was thrilled that her nominee for a local award had been approved, particularly since news of the nomination had leaked out. We turned back at Westlake Drive, about a mile, and took a grassy path around a pond there, where we scared up a pair of mallards. A series of rickety wooden bridges crossed the wetlands but the dismal condition of one forced us to walk through a parking lot to return to the bike path and head east. I talked about my latest assignment in the city arts office. Passing our entry point from Moss Glen, we continued to the trail head at Tuttle Place, which was blatantly obvious once we knew where to look. Interestingly, a “For Sale” sign that had been lying on the ground was now nailed back on a pair of four-by-fours. Cherry shared that a woman she’d met on retreat was so taken by Cherry’s butterfly garden plans that she’d made a donation, despite her limited funds, as this woman had lost her son and had a husband suffering from dementia. Grateful for finding the proper trail head, we viewed the “rest area” and map and returned to the car. The entire trip took about an hour and a half and was four miles total. By then, the sun was peeking through clouds, although the air was still chilly. Looking forward to visiting our first (and favorite?) Friendly’s, we were disappointed to find there was no toilet paper or towels in the ladies’ bathroom. Waiting a few minutes to be seated, we noticed a long table in the back still uncleared from breakfast. Once seated, we chatted quite a bit before finally getting to our order, which our young waiter with a hair wave graciously took. We talked about my upcoming trip to Costa Rica with my traveling friends, The Jeffs, we covered Cherry’s plans to furnish an needy person’s home, and we reviewed our enneagram types. It also turns out that I forgot to tell Cherry about my upcoming ecotherapy class at Connecticut Forest and Park Association or being discovered by yet another one of Thomas and Victoria Williams’s descendants. Lunch came and surprisingly, my BACON & SWISS TURKEY BURGER (All-white-meat Turkey burger topped with melted Swiss cheese, applewood-smoked bacon, fresh lettuce, tomato, Honey Mustard, and mayo on a grilled Brioche roll) came without bacon. Not a huge deal, but it did detract a bit from the experience. Friendly’s has new (to us) tablets at each table for ordering, paying, and playing games. We weren’t able to use the new toy because of specifics of our order (our senior meals came with free sundaes), but they looked interesting. And so did our sundaes, both of us getting forbidden chocolate with hot fudge. Yum. We talked about friends who needed visits and our efforts to provide support. We shared that each of us had plans following this adventure that included MORE food or drink! Finally, it was time to head in our separate directions, both of us satiated with our food and conversation. But just as important was our time outside that we both agreed was therapeutic and rewarding. It is summer and I am walking up the hill through a tree-covered archway on a dirt road, as I have done regularly for the past thirty years. I pause, as usual, at the Dancing Girl, a spindly hemlock with its trunk and roots resembling a gracefully moving young woman. But today, a few feet away from her splaying roots, in the gravelly till of the roadside, I catch sight of a splash of yellow rays and I stop short. Dead in my tracks, as they say. Now, I have started my story, writing what I was meant to write. It has taken me years, decades. All this time, I walk by the Dancing Girl and pay tribute, thanking her, my muse, for this story. Giving the Dancing Girl updates on my minuscule progress, I watch her succumb to hemlock wooly adelgid and become a bare skeleton, as her tops break off and her bark chips settle on the ground. 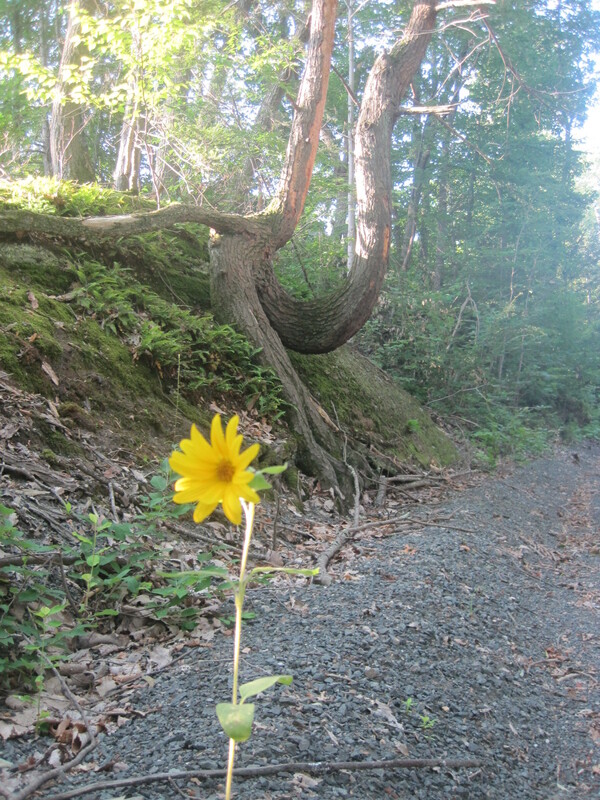 Yet, she still clings to the rocky roadside. I have begun, the story is being told, and as I write, I discover it’s not just the Dancing Girl who has changed over these years, but both of us. I have moved from one who identified the species of trees and gave all things names to someone who experiences those things’ presence. I have changed from one who experienced those things’ presence to someone who realizes I am actually those things, just as they are me. We are all interconnected, and all filled with the same grace that permeates our world, if we are open to it. I pass through the tree archway, no longer evergreen hemlocks but tall swaying oaks and maples and ash. But there I am, naming again. I open my heart to these sheltering trees and I hear them whisper, “We will protect you.” I sense it so strongly; I feel tears of relief. I belong, I am them, they are me, we are part of this living organism, this earth. My role is clear: to live as present and harmoniously with life as is possible. And to tell others about it. “We have begun, the story is being told.” I tell the Dancing Girl, even though she is dead, that her tale will now live on past her decaying trunk. I encourage her to let go and crash to the ground and finally come to rest. Yet, she stubbornly stays. Interview with Beth Lapin and Jen Eifrig on COMCAST channel 15 tonight at 7pm. “Navigating the Publishing World” — if you are in the Middletown, CT area, check it out!